My doctor's appointment was completely uneventful today--just like we like it. My numbers are all in or close to the normal range. Dr. Bienvenu teased me for being disappointed that my numbers hadn't all reached completely normal levels. I can be a very competitive person, especially against myself. Weird, I know. I've been having a problem getting my v-fend prescription filled the last few days. This is an anti-fungal pill that I have to have twice a day. It's much nicer than sporanox liquid and doesn't leave a disgusting after taste. It costs upwards of $2000.00 per prescription and this is the reason that I've been having problems. The insurance company was holding it up because of the cost, which I found strange, since I've been on it for 6 months and there's never been a problem before. I'll be completely out of it on Sunday, which upset Chris, so he called the doctor to see if I could make a substitution, while I called the insurance company. While I tried to explain the situation to the customer service agent, who just could not understand what I was saying, Chris was talking to my PA. It was like banging my head against silly putty. Sometimes it bounced, sometimes it got stuck. Long, convoluted story short, my PA called my doctor and was told that I'd be discontinuing the v-fend next month, so I could just get a jump start and stop early. Imagine me trying to explain that to the customer service agent. December should be an interesting month. For the first time in my adult life, I won't have to go to the mall or any satellite boutiques either to work or shop. Okay, it's not so much that I don't have to, but more so that I can't. Either way, it puts a smile on my face. No long lines, no crazy crowds, not to mention parking rage. I've also found out that I will definitely be stopping a number of medications that I've been taking for preventative measures. I haven't quite sorted out my feelings on this. On the one hand, it could mean that my doctors trust my immune system to do what it's supposed to, and on the other hand, it could mean that I am now wide open to catch a cold or virus. Maybe a little of both. Aside from the EBV flare up, I haven't been generically "sick" in over a year. 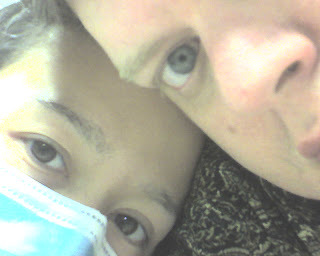 I had strep throat in October of 2006 and that's the last fundamental illness that I can remember. I'll probably think the world is coming to an end when I catch my first cold. Babies just look so miserable when they're not feeling well and I essentially have a 6 month old's immune system. We'll just have to wait and see. Not to tempt fate, but life is pretty great right now. I feel really well and my bald patches aren't bothering me as much as I would have thought. I'm eating like I'll never see food again. I've got the baking bug and have been keeping Chris and Dixie stocked in sweets. I may get kicked off the island for this compulsion because we're all snackers. I've already had 4 pieces of peanut butter fudge today. I'm thinking about having a few more just to keep my strength up. We had a bit of a scare Monday night. Just as we began eating dinner, Dixie began choking on something. Chris performed the Heimlich and I called 911. While waiting for paramedics, she complained that she felt a burning sensation in her throat and that it still felt like something was lodged there. For those of you that have kept up with the blog, you know that something similar happened a few months ago. She's had difficulty swallowing for a few months and doctors haven't been able to give her a reason. I had to isolate myself in one of the bedrooms when the paramedics arrived, so I can only tell you what happened second hand. Dixie's heart rate and blood pressure were dangerously high and she was still having trouble with her throat. She was taken to the hospital with Chris right behind her. The ER doctor believes that the stricture in her throat closed, trapping food and causing her esophagus to spasm in an effort to get the food down. The burning sensation was stomach acid trapped in her esophagus. At some point in the hospital, the stricture relaxed and Dixie was able to swallow some liquids. She was released and brought home in one piece. For the first time in quite a while, I was able to worry about someone else, hovering annoyingly over Dixie and asking questions every few minutes. She's much better now and I am very grateful just to be able to give her a hug. Chris had a dentist appointment and for those of you who know him know what a milestone that was. I will confess to being one of those people who loves the dentist. It doesn't hurt that mine are really great. I love having my teeth cleaned and the words "root canal" don't bother me. Also had quite a few of those. I've been able to nap during procedures and know that this marks me as a freak. Chris, on the other hand, has only been to the dentist once since I've known him. I know this has a lot to do with his pediatric dentist and it really is a shame that some people can just scar you for life. He has a few cavities and needs to have a root canal and his teeth cleaned. This will all be done under conscious sedation next month. Chris is really anxious around dentists. He also gets to have Valium. Needless to say, he is not looking forward to any of this. I'm jealous because I haven't been able to have my teeth cleaned this year. I'm going to see if I can badger my doctor into letting me get it done locally, instead of having it done by the dental oncologist at MDA. I am a freak, I know. My skin continues to be dry and I don't really think it's getting any better. In addition to this, my hair has started to fall out again. It started with my eyebrows getting thinner, and then most of my lower lashes fell out. The hair on the top of my head is noticeably thin, with intermittent bald patches. It's not like the first two times all of my hair fell out. This has been more gradual and frustrating. I'm fairly certain that this is a result of the Rituxan treatment. It has a half-life of something like six months, so it will be swirling around in my body for a little while longer. Maybe this time my hair will come back in a different color--other than white, please. It's been pretty quiet, otherwise. I finished knitting Laren's present and just have to block it so that it stops curling up on itself. I spent some time looking through books for my next project, swearing to Dixie that I would find something more challenging than a scarf. About an hour later, I started knitting myself a scarf. Go figure. In my defense, I get cold easily now that I'm post transplant and I haven't knit anything for my self. This is true if you discount the hat I knit this summer. I think I misread the instructions, so it ended up being much smaller than it should have. It is stretchy and I can get it on my head, but it really is sized for a small child. I have my weekly blood draw on Friday and other than that, there are no concrete plans for the rest of the week. When I was first diagnosed with leukemia, I thought no problem, people get treated for this everyday. When I was told that there was a unique mutation associated with my particular type of leukemia, I thought that if they knew such a thing existed, there must be some form of treatment for it. When I was told that I needed a bone marrow transplant, I believed that I was on the road to being cured. Then I found out that my form of cancer usually only shows up in girls under the age of one and oh, by the way, your ethnic makeup makes it nearly impossible to find a genetic match for a transplant. It never occurred to me to give up. I was told that with the standard chemotherapy protocol for ALL that I'd have a 92% chance of being dead by the end of the year. My insurance company wasn't overly concerned with the fact that I'd be dead and off their books when they denied my stem cell transplant. Still didn't believe it would happen. I discovered that there were a lot of people who cared about what was happening, and took it upon themselves to do whatever they could to help us. Some I knew very well, and some were complete strangers who had read about our story and wanted to help. I was constantly surprised by how caring people could be and the lengths that they would go to in order to make things happen. The insurance company gave in and paid for part of my transplant. The part that they wouldn't pay for involved expanding one of the umbilical cords in order to give me more cells during the transplant. The expansion of the cord was an experimental procedure and was not covered by my insurance company. I didn't have to have the expansion, it just happened that a computer randomly assigned me to have it done for a transplant study. The expansion would potentially increase my chances for success and so we were prepared to pay for it ourselves. Someone beat us to it. To this day, we don't know who sponsored me for the study. We've heard rumors implicating a transplant doctor and we've also heard that it may have been sponsored by a private cord bank. A stranger paid a very large sum of money to give me a chance. I hope they know how forever grateful we will always be. This January, I wondered if I would live to see my birthday. Deep down, it just didn't occur to me that I could really die. I was terrified by everything that was going on and I was worried about how it was affecting Chris and I just wanted to be able to pick up and be normal again. Abstractly, I knew that my prognosis was not good and I could die at any time. I turned 33 in October. 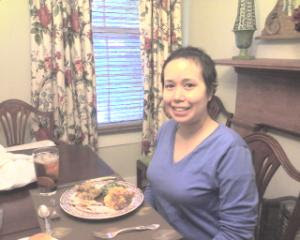 Thursday, I shared a lovely meal with people I love. Today, I sat quietly, alternately reading and knitting. Today marks my sixth month anniversary. I got yet another day to be thankful for everything that has happened to me. I got another day to talk to a friend living far away and another day just to be. I hope to be able to live quietly for the next thirty years, thankful for every precious moment. Today was another trip to the hematologist and Ann's counts are still looking good. Our local doctor continues to say that Ann is the "most normal and healthy looking transplant patient he has ever seen". This time he went one step farther and told Ann that her blood counts are for all intents and purposes "normal", despite being a little below normal in the red blood cell and hemoglobin numbers. I'm not sure the transplant team at MDA would go as far as he did, but it's nice to hear someone in a white coat being positive. Yesterday was Thanksgiving and I have to honestly say that the meaning of that holiday has been wasted on me for the last 36 years of my life. Why? Because, I never had a concrete understanding of loss or fear. I don't want to say that I've had a sheltered life, but I was honestly as ignorant of the words "crisis" or "disaster", as a dinosaur 65 million years ago would have been when contemplating the fire ball created by a asteroid falling from the sky. That's certainly changed and I marvel over how far we have come in almost a year. Yesterday as we sat down to a modest dinner I paused to reflect. Not just on how much I love my wife, but how fragile and precious life and love really are. The struggle to defend them is far more difficult than the vast majority of people realize. However, despite all the loss, fear and suffering we have been through in the last year, I have never been more thankful in my life. Dixie made three desserts for dinner tomorrow and they're just sitting in the fridge, taunting me. We took turns making side dishes that would be baked tomorrow, just to save on time and cut down on cooking all in one day. Chris will be making turkey since he was officially proclaimed the official "Turkey Maker" by his older sister last year. He seriously makes an amazing bird. It's always moist and flavorful and requires no basting. Twelve hours of brining does make a difference. I did something today that just proves that I shouldn't try to do anything important immediately after waking up. All of my medicines are divided in a box that spaces them throughout the day for an entire week. I've been taking them for so long, sometimes I forget to look at the pills before I swallow them. This morning, I took most of my pills without looking, but for some reason I examined my Prograf pill. It's the size of a tic-tac and is banana yellow. This morning it was white which meant that it was double the dosage of my regular pill. I was still half asleep, so I took it without thinking about it. The reason I have the white pills is because I had to have a high dosage right after my transplant. We still had some left over when my dosage was changed and so it was accidentally put into my case. When I mentioned it to Chris, he went into high gear. I had to call my PA and leave a message confessing what I had done. Toby called me back while we were at the vet with Squeeze. Disclaimer: I was waiting in the car while Chris handled the appointment. As far as the "overdose" was concerned, she told me not to worry. The Prograf suppresses my immune system so that I don't reject my graft or vice versa. I'm supposed to be weaned from it next month. Toby also informed me that my FISH test had finally come back. The results were negative. No leukemia, no cancer. I'm very grateful. After Squeeze's appointment, Dr. Hackett came out to the car for a visit. It was really nice to see him again and I really enjoyed the visit. He's been our vet for quite some time and he has yet to ban us for our ill behaved kitties. They've maimed many vet techs and bitten both Drs. Hackett and Mitchell. I'll admit, I've met a few doctors that deserved to be bitten, so I can empathize with the kitties. Drs. Hackett and Mitchell don't fall into that category. I highly recommend them if you're looking for a new vet. I discovered a small lump on Squeeze's back and was worried that she might be developing something sinister. I don't know if you'll remember, but she was very ill and under weight when we returned home the first time. The initial diagnosis at that time was that it was viral, but she was exhibiting signs of intestinal cancer. Dr. Mitchell ruled that out, but I couldn't help immediately jumping to conclusions when I felt the lump. The lump turned out to be an abscess that was drained and treated. We were also informed that it looks like her renal disease is progressing, and we've got a few treatment options that we need to consider. I think it's going to be a an anxious week and I'm sure Squeeze will need a vacation from us when it's done. We have to keep up with how often she vomits, and the amount of water she's taking in, etc. I'm sure it's going to make her paranoid. I can totally sympathize with her. I hate it when people make those kinds of observations of me, but I know it's just because they're worried for me. For the record, I'm eating like a line backer and my "skinny" pants are starting to fit which leads me to believe that they'll be snug in no time. My hair continues to get curlier with each passing day. You can't see it from the picture that was posted a few days ago, but the hair on top of my head actually stands straight up and curls straight back. I try to mash it down when I'm going out in public. I look manic when I let it do it's thing. Kind of like a demented teletubbie wearing a surgical mask. We don't have anything else planned for the rest of the week, save for Friday. It's my weekly oncology visit. Hurray. I'm taking a break from cooking and other things inorder to finish some knitting, so I'm hoping for a nice quiet week. Caroline, I made Bahn Bao and it actually turned out okay. They're like meat pies, only they're steamed. Let me know if you still want the recipe. I can't believe so much time has passed. I feel like I had my transplant yesterday. I've been feeling a bit nostalgic for some of the comfort foods that I grew up on, so I ordered a few cookbooks to help me replicate a few of the dishes. 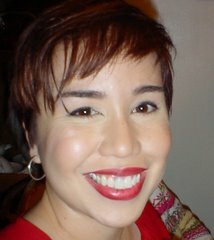 For those of you who don't know, my mom is half Vietnamese and half Chinese. When I was ill as a child she'd make wonderful soups and other dishes involving rice and marinated and stewed meats. Unfortunately, none of the recipes are written down and the few times I tried to get my mom to tell me how to do it, she'd always say, "Oh, I don't know". Then she'd proceed to say you put a little of this and a little of that. No measurements, and after having tried one or two recipes, I discovered that she'd left things out. Very frustrating. So, now I'm armed with two Vietnamese cookbooks and a huge Chinese one. I've only tried two recipes, but they came out just like I remembered. Chris and Dixie have been very good sports about it. I say this, because a few of the dishes can be a bit exotic for some tastes. I'm going to try another one today and then I might retire from cooking for a few days. This is just because I have to wash my hands so often, and I'm still suffering from the skin condition. It makes the skin on my hands very irritated. Mostly my fault, since I always forget to put on gloves when I'm doing food prep. I blame the chemo brain. I've set a few goals for next week, one of which is to organize Dixie's enormous pantry. It's deeper than I can reach, and it's packed to the gills with a combination of "her's" and "our's". Since I'm not naturally an organized person, I can only blame the baby stem cells. I'm beginning to become obsessed with finding a place for everything. I find myself cruising sites offering boxes and bins for everything. I've also begun to get rid of things I don't use. If I haven't used it after X amount of time, I figured that I wouldn't use it anytime soon. This has gone a long way to reducing the amount of clutter I produce. Chris is a naturally neat person, so I know he must really love me to have put up with my mess for the last thirteen years. Luckily, the stem cells have made an intervention and I'm learning to mend my messy ways. Equipped with the noted changes in my behavior and blood counts, Chris has deduced that somewhere out there is a kid who falls down a lot (attributed to the high platelet count), who likes to be neat and is very laid back. I was a type A personality before all of this. Very high strung about certain things. It's nice not to have to worry about the small things that used to stress me out. Laren's present is moving along painfully slowly. I'm staring at the balls of yarn right now and I could swear that they haven't gotten any smaller. I think I'm going to have a mocktail when it's finally done. I have three other projects on needles right now that I'm not looking forward to picking up once I have finished the mystery gift. P.S. I'm sorry for the trouble people are encountering when trying to post a comment. I don't know what's going on, but hope it will be fixed soon. Please don't let it discourage you, since I love to read them. It's my secret addiction. For some reason I developed amnesia on Wednesday and completely blocked my doctor's appointment from my mind. It was some time just before midnight on Thursday that I remembered that I had to be up and ready by 7am to make the drive into Baton Rouge fighting morning traffic all the way. My local oncologist hadn't been in touch with MDA, so he didn't know that I'd been hospitalized. He also didn't know that I'd contracted PTLD. I was reassured that he knew what it was. He joked with me about never doing anything the easy way. Tell me about it. From here on out, I will strive to live a vanilla lifestyle. No more crazy illnesses, please. My numbers were mostly near normal. My hemoglobin and red blood cell counts continue to be low, but I'm not surprised. There are people who are two years out from their transplants that still can't maintain normal numbers. My baby stem cells continue to crank out platelets like crazy. Chris and I have a theory that making platelets is like finger painting for them. Imagine all of the refrigerator art hanging up inside me. I also had to go to a local lab to get blood drawn for the CMV study that I took part in. I only have one more kit to turn in before I'm finished with it. I'll miss getting to see my research nurse, Marilyn, but I'm sure I can track her down the next time I'm at MDA. So, I've been making dinner every night, except for Tuesday when we had take out. I'd like to think of this as a small accomplishment. The first time I tried to cook after we came home the first time, I had the shakes so bad, I thought that I might accidentally cut my hand off. Last night I helped Chris make sushi. Nancy, I promise it was vegetarian. No fish were harmed in the making of my dinner. It was the first form of sushi that I've had in a year and it was wonderful. I did manage to eat too much wasabi and spent the rest of the night sniffling, but it was well worth it. Thanksgiving is coming up and for the first time in almost a decade, I won't be cooking the bulk of the dinner. I'm going to happily sit back and let Chris and Dixie do everything. I might volunteer to sit in the kitchen and look cute while they cook. I might have a nap. Who knows? The menu should be very interesting, and God bless Dixie, she shares my belief in multiple desserts. I hope to see quite a few to snack on over the weekend. I'm also excited that I'll finally have someone to share a pumpkin dessert with. For some very strange reason, Chris doesn't like pumpkin. Very strange indeed. Overall, it's been a very positive week. Chris spent an afternoon rearranging the sunroom so that I could do my own laundry. I did several loads yesterday and I'm sad to say that I loved it. I haven't folded any of it, but there's always this weekend. When I first discovered a lot of the blogs I read today, I would check every day for a new posting. Then I would get impatient when some didn't post often enough for me. Got up. Showered. Got dressed. Ate. Brushed my teeth 3 times within 2 hours because I kept forgetting that I had already done it. Watched TV (or insert mindless activity here). Slept. Doesn't make for an exciting read. I'll try to keep the posts frequent and will definitely post as I find things out, but I'm not sure if there will be anything before Friday. The whole week has been blah, except for Friday morning. I'm still having problems thinking clearly, so there's no telling where this will go. Friday morning we got a call from Toby, Dr. Kebriaei's PA with news about some pending tests. I know I'm going to forget something, so please bare with me. My EBV test came back negative. This means that the test they use can't detect the number of viral copies in my blood. Great news on the PTLD front. I've already been told that if my EBV numbers go up, I'll automatically get PTLD treatment. This is just so it doesn't go full blown again. Fine by me. My LP came back clean. 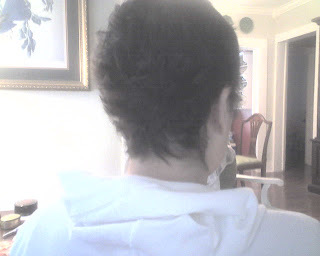 No PTLD in my spine or brain and no leukemia. Yippee! Three more LP procedures to do. Three more months of brain freeze to go. There is still no news on the last of my cytogenic tests. For the life of me, I can't remember what it was for. I'm sure Chris will update on it later. This is the test that gets sent off to a lab in California and has been pending for about three weeks or so. I've been feeling a little up and down since my last dose of Rituxan. I always feel great for a day or so following a dosing, then the little critters inside me start to die off and that starts to make me feel a little run down. This is also about the time when my temperature starts to fluctuate, which puts Chris on the edge. I ran a temperature of 100.3 Friday night and that caused quite a stir. I forgot to mention that I was told that I could have my PICC line removed. Hurray! Toby advised us to find a doctor locally to have the procedure done. For the life of me, I couldn't think of who to call. Do you call your GP, or Internalist, or do you track down a vein specialist? I know I was putting way too much thought into it, but when you've had a stem cell transplant, other doctors who don't specialize in your particular "uniqueness" tend to freak out. Since it was early in the day, Chris and I decided to just drive down to Houston and have it done at IV therapy. We called in to MDA and left a message asking for a doctor's order and took off. Because of traffic and other stops, we didn't' get into Houston until 4pm on the dot. We had my line taken out by 5pm and headed back to Baton Rouge. Here's where the fun part starts. Remember me carrying on about how my brain takes a vacation after chemo treatments? Well, I had methyltrexate injected into my spine during my last lumbar puncture. I am well and truly 50 IQ points off of my game and I have ADD worse than you've ever seen it. Shiny things fascinate me. Chris and I take turns driving back and forth to Houston and since my night vision is better, I usually do the return trip. Mistake. There are a lot of shiny things at night, I'm just saying. I managed to miss the turn off to LA and headed for Dallas, instead. In my defense, I was fixated on the shiny white car ahead of us and when they turned off, I just automatically followed. It took about 15 minutes to find our way back to the interstate and then I managed to miss another turn and ended up heading back into Houston. We got back into Baton Rouge just after 10:30. I console myself with the fact that I was minus my PICC line. This leads me to wonder if the scar on my arm will match the one on my chest. This is when my temperature registered so high. Chris and I were too tired to drive back to the emergency center at MDA, so there was a bit of contention about what to do. We decided to get some sleep and see what my temperature was in the morning. 98.4. My skin continues to be dry and Chris has almost convinced himself that I have a light case of GVHD. There are areas of raised redness on the backs of my calves and the tops of my forearms. They don't itch, but they do occasionally feel irritated. I'm continuing on with the treatment that my doctor recommended and I have an appointment with the oncology dermatologist next month. My transplant doctor wondered if I was having a delayed reaction to chemotherapy, i.e. skin toxicity. I wouldn't be surprised at all. I threw up on myself yesterday, which hasn't happened in a long time. I've always managed to get to something before it happened. Chris and I were driving back from Whole Foods when I just started to feel bad. It just crept up on me and I thought that it was lack of food since I hadn't eaten yet. Chris stopped to get me something to eat and five minutes after I finished, I vomited. Not an all around good day. I felt better by evening and after a light dinner I vegged out on the couch. That sums up my weekend. It has been a long few days and we're just now getting settled back in. We got into Houston late Sunday night and stayed in the hotel connected to the medical center. Very convenient if you ever have to go. There's a skybridge that connects the two buildings and you can get your blood drawn at the hotel for labs. Our first appointment was for 8am and luckily, our next two appointments were in the same location. Blood draw, variable lab test, and a chest x-ray. Unfortunately, I didn't know that a test to check my Prograf levels had been ordered and I took my pill, when I shouldn't have. I had to sit trough a fifteen minute lecture from the phlebotomist who told me that I would have to come back after 1pm to redo the test. After this little morning wake up we had to go to infusion therapy because one of my lumens had become blocked again. Those of you who follow the blog know that this has happened on several occasions and every time it does, there is no blockage. On this occasion, there was massive blockage. The IV therapy nurse had to inject a clot dissolver into the line and I had to wait an hour before they could try to extract the blockage. This worked out well because we ran into some friends from BMT that we haven't seen in months. Sherry and Wayne were always our waiting room buddies (the Olivers and Paynes, too) when we were shackled to the tenth floor for infusions. Wayne was busy developing level 3 GVHD of the liver and digestive tract while I was working on my PTLD side project. He's lost over 50 pounds because of it, but he still looked good. There's something about a person who won't give up. We traded war stories and talked about future plans. Sherry and Wayne still haven't been released to go home yet; they're day +120. Maybe by Christmas, they said. After a very nice visit with our friends, it was time to go back into IV therapy to see what we could see. The clot had dissolved and as a bonus, I got my dressing changed. By the time this was all over, it was time for me the check in for my CT scan. For some reason, I had to go to the outpatient building, which is 2 blocks away. This is not my favorite place since things always seem a little chaotic. I was called almost immediately, only to sit in the back amongst fifteen other patients. The really embarrassing part about this whole things is, we were all wearing the same shirt. Could you imagine? No, really, you know the ill fitting scrub top they put you in for x-rays. No comfort or warmth. We all huddled under our blankets, waiting to be called. There were 4 men ahead of me waiting for a CT scan, so I had plenty of time to just sit. I did have one near altercation with a nurse. Everytime you go to get scanned, you have to sign a waiver stating you're not pregnant. I signed mine as soon as I checked in. Imagine me sitting between two older gentlemen who look fairly uncomfortable in borrowed jammies when the head nurse approaches me. She pulled over a stool and with paperwork in hand, began to interrogate me about the answers that I filled in. Her first question, "Are you pregnant?" My body has been saturated in toxic chemicals for the last nine months. In addition to this I get a lupron shot every three months to shut down my ovaries and put me in temporary menopause. I also take a birth control pill. Then there's the whole feeling hideous most of the time thing that puts me off my game. To the nurse I replied, "I'm not." She stared at me for a full minute before insisting, "And how do you know?" I decided to stare her down as the men next to me squirmed in their seats. Apparently, she'd had more practice because I broke first. I had to do a run down of all the reasons that I couldn't be pregnant before she would leave me alone. Good grief, people! I'm not even allowed to be in the same room as a small child, trust me, I'm not incubating one. After 2 hours there, we were free to go back to the hotel. Chris and I were looking forward to a nice nap until we hit the next snag. Neither one of our room keys would work. I'm not going to tell you how we did manage to get into the room, just suffice it to say we did. Chris called the front desk to find out what the problem was and it was us. The hotel room had only been booked through Monday and they didn't have any available rooms to move us to. So instead of that lovely nap, we packed up our belongings and moved to a hotel down the street. Tuesday was a new day and I was determined to pose as the picture of health so as not to have to stay another day. I had a nursing visit at 10:15 which turned out to be the nurse making sure that I took my Ativan before the procedure. Good stuff. Thirty minutes later I was in a procedure room and the intrepid Jill was prepping me for my lumbar puncture. If you ever have to have an LP, Jill is your girl. She keeps you entertained while she's working and doesn't seem to mind that your speech is slurred and you're not making a lot of sense. After this procedure, you have to lie flat on your back for at least half an hour and my leukemia doctor liked you to have a caffeinated beverage to stave off headaches. So, I got to lounge on a stretcher while trying to drink a coke sideways without spilling. My doctor came to see me to save time and overall, I'd say it was a successful visit. My dry skin continues to cover me head to toe and I'm to continue doing what I'm doing for it. The node in my lung which was first discovered at 2mm and then grew to 5mm is now 3mm. She's pleased and so am I.
I can almost breathe out of my left nostril which is ancillary evidence that the mass in that sinus cavity is getting smaller. Another thumbs up. She didn't feel anything weird or out of place in my thoracic cavity--enlarged spleen or liver--so that's good. I have a 7mm node in my thyroid. They don't get worried until the nodes measure over 1cm. Just in case, she's conferring with some colleagues in endocrinology to see if they want to do anything given my history. I plan on doing my best Scarlet O'Hara. Tomorrow is another day. 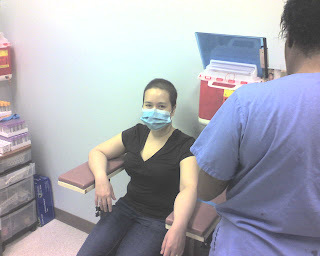 After this visit, I was squeezed in to see an ENT because of my perpetuating sore throat. I finally got validation that there is a sore on the side of my tongue. It's in a really hard place to find and the doctor had to pull out a few tools to find it. She put me on antibiotics just in case and prescribed me an ointment to put on the sore on my tongue and if I can manage it, the spot on my tonsil. It has a very foreign taste to it and it sticks just where you put it. You can feel the little lump of ointment in the back of your throat and it's very hard not to gag. The sore spots do feel better today, though. 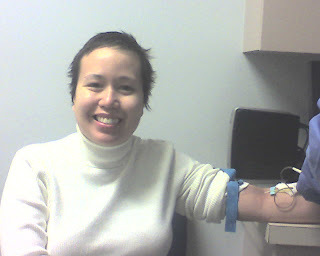 After this, I had to hurry to the ATC to get my last dose of Rituxan. We only had to wait an hour for an open room, this time. Too many patients, not enough nurses. Since I was driving back to Houston this time, I announced that I was having a nap and promptly passed out. I suppose this is another example of me being non-compliant since your vitals have to be taken every 15 minutes for 2 hours. Who could seriously stay awake after the kind of day I had just had? I woke up 3 hours later, just in time for the vitals nurse to come in and tease me. We were done by 7pm and couldn't hit the road fast enough. As a side note, if you ever have to take a trip with me and I'm the designated driver, plan on delays. There were 3 accidents along the way that slowed traffic and blocked lanes. One on the Mississippi River bridge worried us, because it looked like it had happened well before we had gotten there and there were no patrol cars or paramedics present. It involved one car that looked like it had clipped the wall and spun out of control. Chris called it in and found out that it hadn't been reported yet. A dozen cars had to have passed it before us, and no one called it in? That's atrocious. Thanks to maintanence on MDA's wifi network I wasn't able to post these files. So I figured since today was slow I would play a little catch-up. Here is the movie we shot while in the hospital that I couldn't post. Hope everyone enjoys it even if it is a bit late. 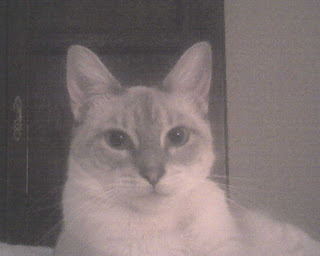 Etsuko the Cat: Ann's cream colored nemesis! Ok so thats it for tonight. We have apointments at MDA the first part of next week so we are relaxing and paking up for the trip back to Houston. Ann has not developed any new strange or otherwise alarming symptoms. Things look good so far and next week will be Ann's last (planned) dose of Rituxan. Like other days when there are no appointments scheduled, I have very little to report. We still haven't taken a picture of my new curls, but I promise one for tomorrow. As Chris mentioned in the last post, my skin has become very dry. I've never really had this type of problem in my lifetime. Just the opposite. Now I find that I'm scaly from head to toe. Very pretty. When my doctor worried aloud that it might be a fungal infection, I wondered how that could be. How could you have a fungal skin infection covering every inch of your skin? That would be horrific. The moisturizer that was recommended seems to be working. The skin on my shoulders and legs seems to be healing and at no point have I suffered from itching. Of course, I seem to be the princess of obscure side effects and infections, so I'm not ruling anything out. I have developed a chronic cough that is worrisome to all in my life. It started in the hospital this last go round as a small thing when I would go to bed. When I got horizontal I'd start to cough for a few minutes. It was over almost as soon as it began, but with each day, it started to get a little worse. We've lost friends who've had transplants to a "little cough." I've started to cough a little during the day and it was something that we thought significant enough to mention to my doctor. If you'll recall, I've complained of a cough before and it was resolved with claritin. Pesky post nasal drip and allergies. It turns out that I haven't been taking claritin for a few weeks now. Almost as long as the cough has persisted. Dr. Kebriaei discovered this on our last visit. I thought that I'd been taking claritin, but it turns out that Chris had stopped giving it to me. The last Pharm-D made it an "as needed" drug, so it got discontinued. Needless to say, we started it again yesterday and the cough has receded significantly. 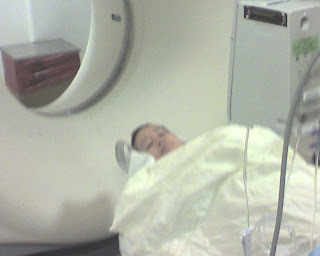 Regardless of the success of resuming claritin, I still have to have a CT scan next week. The doctor doesn't want to take any chances because of the node in my lung. I remember when my dad was diagnosed with lung cancer, it all started with a cough. Another transplant doctor assured me that it probably wasn't lung cancer. How can you reassure someone using the word probably? Just a thought. And I'm definitely not looking forward to the iodine that they inject you with in order to achieve contrast in the imaging. It makes you hot and flushed and there is the sensation that you just wet yourself. On top of that, it's bad for your kidneys. My poor organs are so full of chemicals, I'd probably glow in the dark if you dissected me. The one draw back to my starting claritin again is that it makes it hard for me to sleep regardless of when I take it during the day. I kept waking up last night for no apparent reason and it wasn't as if I wasn't lucid. Chris kept asking me what was wrong and I couldn't form a valid answer. I'm hoping for uninterrupted sleep tonight. There is very little else to report. I'm determined to finish Laren's gift this weekend and then I'll pick up a project for myself. I watched a knitting show today and the advertised project was for beginners. It made me think that I needed to take a knitting class, because I just couldn't follow some of the stitches. Beginner indeed. I'm still determined to knit a sweater and have it finished by this time next year. Perhaps I'll just jump in and choose an intermediate project, so there.